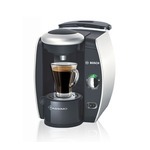 Tassimo is a hot beverage system that features perfectly brewed coffee. Unique bar code technology allows the brewer to read a bar code on each T disc and deliver a tasty cup each and every time. Each T disc's bar code signals to the machine the optimal amount of water and temperature required. 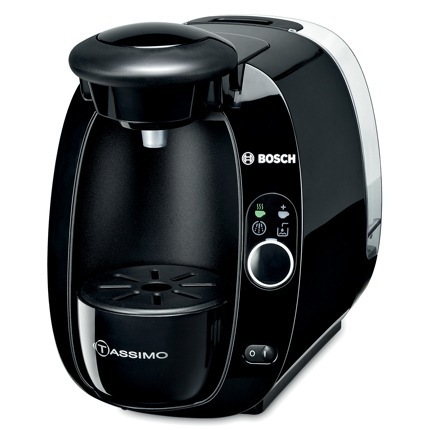 The fully automatic brew cycle can be interrupted at any time to adjust drink strength to taste. 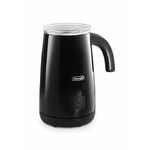 Includes an exclusive flow through water heater for faster, quieter brewing. Great machine. It’s great for waking up and only needing your one cup of coffee. It’s quick and easy to use. Love the choices offered in coffee and tea and especially the hot chocolate. Not the right product for me, or my work colleagues. Work colleagues begged us to get a single-serve coffee machine. We bought (three) machines (two in active use, one as a spare), and they were told to buy their own coffee/tea cartridges. It turned out to be a short-lived novelty. At first, one machine was used almost daily, or several times a day. One year later, we took the machine off the counter, as it wasn't being used at all. We still have a machine in our boardroom kitchen (which the company supplies cartridges for). It's used so infrequently that the cartridges are purchased, not because they've run out, but because they are significantly past their best-by date. I personally bought several varieties as "treat coffee": french vanilla and hazelnut (awful taste, great smell), latte/cappuccino/hot chocolate (better taste, limited shelf life), and we've bought several kinds of black coffee for the boardroom. I didn't feel good when I was drinking the coffee from this single-serve machine. I wonder if it has something to do with the super-heated plastic cartridge as part of the processing? The machines have been reliable (after a small safety recall for the cartridge holder a few years ago). We didn't need to descale the machines (didn't use them enough), though we were advised to buy the solution on purchase, as the machine would quit without notice if it needed descaling. 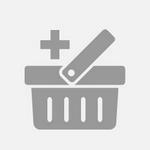 I see many of these machines on local auction sites/for sale sites. They don't seem to get as good a review as their major competitor in the single-serve category. So no, I wouldn't recommend purchasing a Tassimo. I've had my Tassimo Machine for over a year and I love it. No issues at all I clean it after each use. I get great tasting coffee in less than a minute. I have a great selection of all the hot beverage I want. Quick and easy. I love my Tassimo. 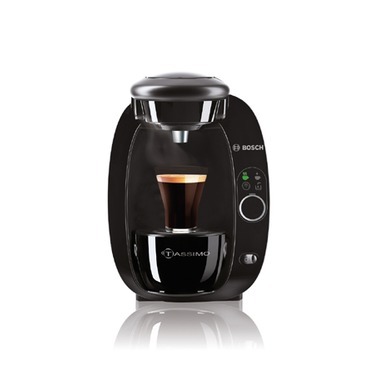 I just love this machine , I got it as a gift from my brother and I'm addicted to it , it's so easy to use you just put in your coffee and bam u have coffee you don't have to montoir it at all its so easy to use .and it has such a variety of coffee to chose from I totally recommend this product . 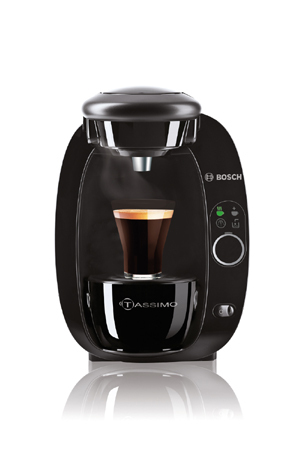 I'm absolutely in love with my Tassimo T20 brewing system! I had been on the hunt for a good single serve coffee machine for a while now and when I saw that we had these on sale at work I knew I had to grab one. I actually get 10% off for an employee discount too, so it was an even better deal. It's super quick and easy to use. Makes great cups of coffee and is super cute too. Their customer service is great too! I called about 3 times with questions regarding the noise and "is this normal?" thing when first getting it started and they were super helpful and kind. I caved and bought my fist Tassimo when Tim Hortons had a promo on and they were super cheap. I had wanted a machine for a while but not being an early adopter I wanted to sit back and watch and read about other peoples experiences before I took the plunge. The Tim Hortons promo pushed me over the edge and I made the purchase. I'm glad I didn't pay full price for the machine. It was a huge disappointment - kind of like the time I splurged and bought the Starbucks espresso machine (coffee is just better made by someone else). Back to the Tassimo though- it was a huge disappointment. The "cup" of coffee it made was more like a 1//4 cup of coffee. The specialty drinks where disgusting and again did not fill the cup. They also required 2 steps which is just inconvenient and messy. I wanted to be able to push a button and have a cup of steamy delicious coffee in minutes just like all of the ads, that sadly was not the case. It's far easier to drive to the coffee shop and have someone else make it for me and probably cheaper once you factor in the cost of the little pods that don't deliver a full cup of coffee anyway. I first got my Tassimo machine on a Tim Horton's promotion. I wasn't interested in getting one of these machine's at all, but now that I have it & use it on a daily basis, I wouldn't want to be without it, & I do highly recommend it to anyone that drinks coffee. I bought this thinking it would be great. I was highly disappointed. The amount of liquid you get in your cup is about half of what it should be. The specialty drinks are awful. Honestly, the cadbury hot chocolate almost ended up on my carpet because I wanted to spit it out. This has to be the worst of the single drink makers.